Good photographs can transport you in your mind to the scene they depict. With Photographs of North Stoke-on-Trent you will see something of the nature of the Potteries. The dependance on the pottery industry for employment in Stoke-on-Trent has long gone, although the heritage is still kept alive by some important ceramic companies and smaller pottery firms. Photographs of North Stoke-on-Trent will help you to appreciate the dynamic re-development of the old factory sites and show how Stoke-on-Trent is expanding into the future. The Gilded Angel stands atop the clock tower of the old Burslem town hall in the large photo on page 4. Not far away down Nile Street is the now deserted factory where once the prestige tableware of Royal Doulton was manufactured, seen in the top picture on page 5. Below this is a photo of a housing regeneration project under construction, there is an increasing number of these in Stoke-on-Trent. Page 6 has two photographs showing a building project further north in Tunstall. Going south now to Hanley there is the Mitchell Memorial theatre next to what was once a cinema and bowling alley, now being cleared for further new projects. The land around the bottle kilns used to be a pottery works, now all that is left are listed buildings to be incorporated into new buildings. On page 8 the top photo shows a sculpture dedicated to the industrial heritage of Stoke-on-Trent standing in a landscaped area with the Sentinel Office and print works behind, once occupied by Shelton Steel works. The lower photo is still taken from within the boundary of Stoke-on-Trent near to Brown Edge Schools, a village nestling on the hillside of the valley where the River Trent begins. The city can be seen in the distance. Page 9 has a view from the same place towards Mow Cop over the rolling fields towards Biddulph. The final photograph was taken in the early hours of a winters morning in one of the many Victorian Parks within the city, this is the lake in Hanley Park. Photographs of North Stoke-on-Trent is a PDF eBook available with 11 high resolution photographic images costing just �5.47 which is less than 50p an image. 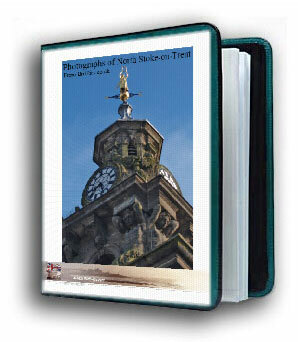 Photographs of North Stoke-on-Trent is delivered in PDF format and is viewable on any computer. All you need is Adobe Reader which is available free and already on most computers. To print a photograph zoom in to fill the Acrobat Reader window and print current view.